In this episode we’re not looking at viva experiences, but catching up with a previous guest on the podcast. Dr Helen Kara shared her experiences in Episode 33, and told us about how she completed her PhD part time and what happened in her viva. For Episode 59 she’s sharing her experiences as an alternative academic, and telling me a little about what it means to be an independent researcher. Helen shares some great advice for anyone who is thinking about this as a career path – plus we make time to talk about our recently self-published book Self-Publishing For Academics! You can find Helen on Twitter as @DrHelenKara and I recommend checking out her Amazon author page for a full listing of all of the books she has written for researchers. 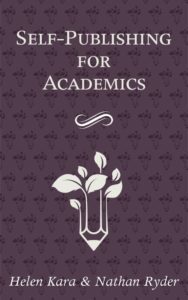 If you’re just starting out on your PhD, or know someone who is, then check out her book Starting Your PhD: What You Need To Know, it’s 100% free and 100% helpful. In the first episode of 2015, I’m very happy to be interviewing Dr Helen Kara, who is an independent researcher and director of We Research It Ltd. Helen completed her PhD on the emotion work of managers of Sure Start Children’s Centre, and it was great to talk to her about this – and of course her viva – but also her experience of starting a PhD following several years of being a researcher. Helen has written a book on research methods, as well as several short guides on aspects of doing research. You can find her Amazon author page here. Feel free to leave comments or ask questions on this post, or you can get in touch by tweeting @VivaSurvivors or emailing me! I’m looking for more interviewees to share their PhD and viva stories this year, as well as people happy to talk about academic life or being an examiner. Please get in touch!